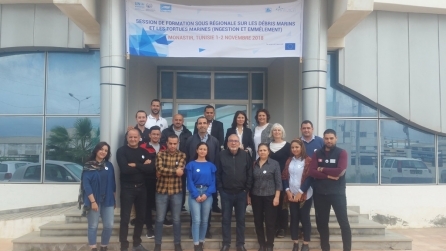 SPA/RAC has organized in collaboration with INDICIT Project a sub-regional training session on 1st and 2nd November 2018 at the rescue centre of sea turtle (INSTM), in Monastir, Tunisia. Three sea turtle species are found in the Mediterranean (leatherback, Dermochelys coriacea; green, Chelonia mydas; and loggerhead, Caretta caretta), but only the green and loggerhead turtles breed in the basin. Green turtles are primarily herbivores, whereas loggerheads are primarily omnivores, resulting in their occupying important components of the food chain; thus, changes to the status in sea turtles, will be reflected at all levels of the food chain. Populations of marine turtles in the Mediterranean have been decreasing steadily through the last decades. Both nesting and foraging areas of marine turtles are vulnerable to anthropogenic pressures in the Mediterranean Sea, including an increase in the exploitation of resources (including fisheries), use and degradation of habitats (including coastal development), pollution and climate change. These issues might reduce the resilience of this group of species, negatively impacting the ability of populations to recover. The risk of extinction is particularly high in the Mediterranean because the breeding populations of both loggerhead and green turtles in this basin are demographically distinct to other global populations and might not be replenished. As part of the Regional Plan on Marine Litter Management in the Mediterranean (RPML) adopted by the Contracting Parties to the Barcelona Convention in 2013 (COP18) and came into force in 2014, Mediterranean countries are expected to implement the Integrated Program for Monitoring and Assessment of the Mediterranean Sea and Coasts (IMAP), partly based on the 10th Ecological Objectives’ Candidate Indicator 24 (CI24) on amounts of litter ingested by marine organisms or organisms’ rates of entanglement. One of the target species for the IMAP Candidate Indicator 24 and also suitable for monitoring on Mediterranean scale is the most abundant species of marine turtle in the Mediterranean, i.e. Caretta caretta, widely distributed throughout the basin and for which a great deal of information is available. In this respect, protocols for monitoring the interactions between marine litter and marine turtles (ingestion and entanglement) with a view to the harmonization of monitoring and evaluation data collection methods in the Mediterranean have been developed by SPA/RAC in the framework of the implementation of the EU-funded Marine Litter MED Project. In order, to test these protocols, UN Environment/MAP SPA/RAC has organized in collaboration with INDICIT Project a sub-regional training session on 1st and 2nd November 2018 at the rescue centre of sea turtle (INSTM), in Monastir, Tunisia. 10 participants, veterinarians and scientists involved in sea turtle stranding networks, from Algeria, Libya, Lebanon, Morocco and Tunisia participated to the theoretical and practical training sessions. During the training sessions, theoretical and practical courses were delivered by the Trainees, recalling the status of Marine Turtles in the Mediterranean, the main threats and the frameworks of the training. The participants had the occasion to carry out necropsy of dead turtles, collection and classification of the ingested marine debris according to the Med Marine Litter protocols. Therefore, the training was an opportunity to test the feasibility of the protocols, where further recommendations were expressed by the participants to improve its implementation for better monitoring activities.